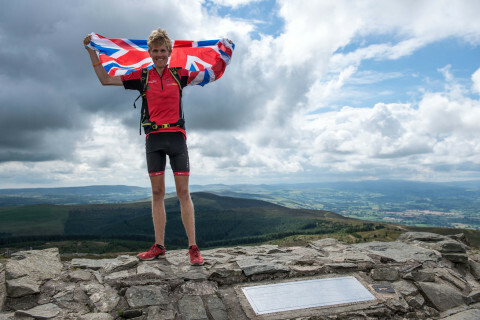 Alex Staniforth has become the youngest person to climb all 100 UK county tops after completing a non-stop 5,000-mile journey on Flintshire’s Moel Famau yesterday (July 23rd). The 22-year-old began his Climb The UK Challenge on Cheshire’s Shining Tor on May 13th and has since walked, cycled, and run to the highest point of every county in England, Wales, Scotland and Northern Ireland in just 72 days; which also makes him the fastest person to complete the challenge. Alex – who planned and navigated his entire trip using the ViewRanger app – battled extreme weather, injury and exhaustion on a journey that saw him climb the equivalent of 13 Mount Everests and raise more than £20,000 for his chosen charity Young Minds. “It feels surreal to have completed my hardest challenge to date,” said Alex. “Reaching the top of Moel Famau felt like climbing my own Everest, but even better because I’ve been able to share this journey with the hundreds of people who joined me along the way. Alex’s journey was almost entirely human-powered, including a return kayak journey across the Solent to the Isle of Wight, with the only motorised transport being ferries to Northern Ireland and the Scottish islands. Travelling with minimal kit and often cycling more than 80 miles a day, reliable navigation was vital to the success of the challenge. Using a combination of the ViewRanger app, a rugged CAT S60 smartphone and a CASIO PRO TREK Smart watch, Alex was able to successfully navigate all 100 peaks – including the iconic summits of Ben Nevis, Scafell Pike, Snowdon and Slieve Donard – with supporters following his progress live on ViewRanger’s tracker map. Now we can’t wait to see what he does next! Relive Alex’s journey on his ViewRanger tracker map here. Download the ViewRanger routes for every Climb The UK peak here. Alex Staniforth is a 22-year old adventurer, fundraiser, endurance athlete, motivational speaker and ViewRanger ambassador from Cheshire – and now the youngest person to climb the highest point in all 100 UK counties. He continues to overcome adversity, inspiring others to achieve their full potential and make a difference.